It’s that time of year again—classes have ended and summer is just beginning. For many districts, this is when annual maintenance projects begin on buildings, equipment, and grounds. Some of the most common plans include deep cleaning, painting, replacing carpet, and ensuring playground equipment is safe. But, one very important project is missing from many schools’ summer maintenance programs: lighting upgrades. We already know through numerous studies that daylight is an important factor in human health and well-being; it dictates our natural circadian rhythms and is also used to treat depression and seasonal affective disorder among other things. But, how does that translate into the classroom? By improving school lighting, and more specifically classroom lighting, we are able to assist our students by creating an optimal learning environment. 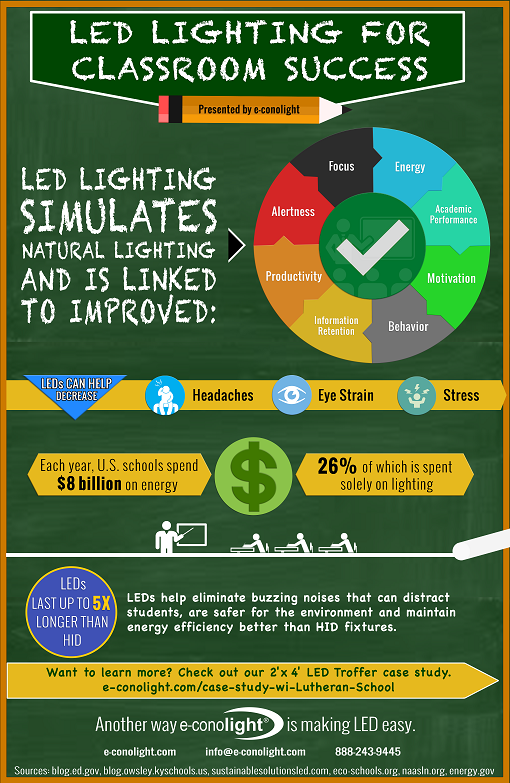 In addition to increased productivity, LEDS make school lighting more cost-efficient because of high energy savings. The paybacks don’t just end inside the classroom; 80% of lighting operating costs can be saved by replacing traditional fixtures with LEDs. It’s easy to see why experts predict more and more schools will adopt LED lighting in the next few years. Learn more about how you can improve your own classrooms and your students’ performance with products and case studies from e-conolight.